Can the World Cup bridge South Africa's sporting divide? While South Africa is witnessing a surge in national pride as it prepares to host the football World Cup, sport in the country is still heavily divided along racial lines. White South Africans were once keen followers of football, but this changed when racial segregation in the game ended in the 1980s. "It's quite ironic that white people abandoned football after integration, when a single multi-racial league was formed," says the Johannesburg-based political analyst Aubrey Matshiqi. "Whites saw themselves as Europeans, not Africans." Leading South African football commentator Mark Gleeson says the situation has changed since then. "Over the last 10 years, more whites have been going to matches but the number is still insignificant," he says. "It's nothing like when whites had the security of apartheid, and blacks were kept away from them," Mr Gleeson says. He adds that fewer white people are playing football now than ever before, with only defender Matthew Booth in the national squad. "Previously, there were strong amateur leagues among whites. Now they have been amalgamated with weaker ones from [black] townships. "A parent with little Johnny won't want him to go there [townships] on a Saturday morning," Mr Gleeson says. With the World Cup approaching, white South Africans are, however, rallying behind the national team, Bafana Bafana. But Mr Matshiqi cautions against romanticising the political impact of the tournament. "It [the World Cup] will create an emotional bond among South Africans, but it will not end the divisions caused by more than three centuries of apartheid and colonialism," he says. "Reconciliation is like building a house, and the World Cup is just one brick." Mr Matshiqi points out that South Africa also witnessed a burst in national pride when it first hosted the rugby World Cup in 1995, just a year after the collapse of apartheid. And when the national team, then still seen as a symbol of Afrikaner nationalism, won the tournament, South Africa's first black President Nelson Mandela donned the Springbok jersey and embraced the Afrikaner rugby captain Francois Pienaar in a powerful gesture of reconciliation. "But the unity turned out to be false. After the World Cup, the rugby world retreated again into the Afrikaner laager, and alienated new-found black supporters," Mr Matshiqi says. Tensions boiled over when rugby administrators resisted moves to make the game more racially inclusive. Mr Mandela retaliated by appointing a commission of inquiry to push through change, but rugby chiefs took him to court to block the inquiry. The government won the legal battle but, as Mr Matshiqi points out, "it was a low point. It showed that what happens afterwards is more important than what happens during the event". Mr Gleeson explains that the political dynamics in rugby have changed dramatically since that fiasco and self-enforced quotas have been introduced requiring the inclusion of black players in teams. "We've had a black captain [of the national team] and we are seeing more black players," he says. Last weekend, rugby authorities took another step towards popularising rugby among the black population, with a top Afrikaner-dominated team, the Bulls, playing a match in Soweto for the first time. Image caption Will the World Cup bring blacks and whites together? Mr Gleeson says that "buppies", or young, upwardly mobile blacks, are increasingly following rugby, attracted by its exclusive image as a game for the privileged. "Middle-class blacks feel they are conquering what once seemed unconquerable - rugby, a bastion of apartheid," he says. 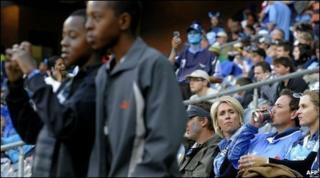 But ultimately will the World Cup change South Africa's racial dynamics? "Events like these bond individuals to a country. They don't bring individuals in a country together. People will still have separate lives and separate identities," Mr Gleeson thinks. But for now South Africans are determined to simply enjoy the football extravaganza - although no-one expects the under-performing Bafana Bafana to raise the trophy. "If we support them because of their performance, we'll all be in depression," Mr Matshiqi says.